You may ask, “Where does it go?” The answer grows uglier every day: the ground, air and into our oceans! “Back in 1991, my ship, the Sea Shepherd, was anchored in the harbor of Port of Spain, Trinidad,” Captain Watson said. “A few hours later, the entire surface area of the harbor was dirty white, as if an ice floe had entered this tropical port. The "floe" consisted of Styrofoam, plastic bottles, and assorted plastic materials, as far as the eye could see, and it had come down from the streets, gutters, and streams into the harbor. And, of course, it was all washing out to sea, dispersed by wind and tide. “What happened to it after that? The sun and the brine broke it down into little pellets of Styrofoam and little pieces of plastic - each an insidious, floating, deadly mine set adrift in an ocean of life. In the movie “Castaway,” Tom Hanks, marooned on a desert island in the South Pacific, finds a plastic siding of a portable outhouse washed up on the beach. The stuff floats everywhere. 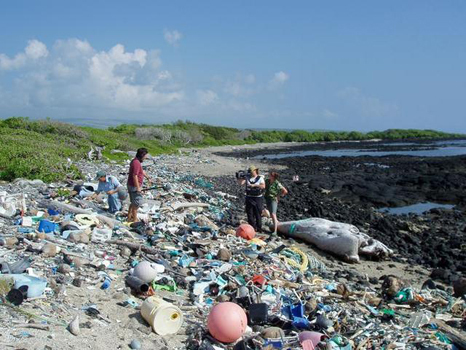 Watson found plastic bottles with Japanese, Chinese, Russian, and English writing littering the beaches of even the most remote Aleutian Islands. “Drifting in our seas are tens of thousands of miles of monofilament ghost drift nets and lines,” Watson said. “This same netting ensnares ship props and the necks of sea lions and turtles. Over the years, my crews have retrieved hundreds of floating monofilament nets from the sea. All of them contained the rotting corpses of fish and birds. Watson continued, “Oil spills occur every day in our oceans, and major spills occur on average every two weeks somewhere in the world's marine ecosystem. Although these oil spills are notorious killers of marine wildlife, their deadly impact is confined to relatively small areas geographically, and the impact is reduced with time. The Exxon Valdez spill, for example, was confined to Alaska's Prince William Sound, and although the impact on wildlife was felt for many years, the ecosystem recovered. Yet this other kind of petrochemical spill is more invasive and permanent. We face a global problem, and for seabirds no safe places exist. For most people, the ocean provides a virtual toilet. Unfortunately, nothing flushes away; it circulates forever. “The oceans pulsate with powerful currents, and these currents keep plastic debris in constant circulation,” Watson said. “As a result, debris travels in what are called "gyres." The gyre concentrates the garbage in areas where currents meet. For example, one of the largest of these movements in the Atlantic is called the central gyre, and it moves in a clockwise circular pattern driven by the Gulf Stream. The central gyre concentrates heavily in the northern Sargasso Sea, a place that is also host to numerous spawning fish species. Unending amounts of plastic pellets wash onto beaches worldwide. In New Zealand, one beach was found to contain over 100,000 pellets per square meter. Thus, it is not so farfetched to suggest that people are in fact sunbathing on plastic beaches - literally. “I have stopped my ship in mid-ocean and found flip-flops, suntan oil bottles, plastic Coke bottles, garbage bags, and even large floating industrial plastic sheets. In each place sampled, we have also found plastic pellets,” Watson said. “Once, on the bottom of the Mediterranean off France, I witnessed a scene that appalled me. The entire bottom was made of plastic. Bottles and plastic bags swaying with the tide, replacing the sea grasses and algae. It was sad to see one little fish scurry from behind a white plastic bag to take cover from me in a sunken automobile tire. What can we do to change this destruction of our natural world? We need an incentive driven, 10-20 cent deposit/return on all plastics sold anywhere in the world to ensure return. Such an economic incentive will make certain that all plastic will be returned either by the customer or an army of kids picking up plastic trash for money. Simple, easy and effective! Thankyou very much for this piece. I am in grade 9 and for a oral assingment i have chosen to speak about this. This article has given me great infomation and fantastic facts which will hopefully touch the adults, teachers and children. Except i dont know how to present it so that they will listen???? But i just cant believe how people can do that to our environment. If all our marine wildlife were to become extinct i just dont think that people belive that extinction is forever and we cant get it back. Thank you for this wonderful article. What an absolute shame that we're putting our sea creatures through this horrendous torture. Too bad we don't put two-and-two together -- we're eating this marine life poisoned with plastic (well I'm not, as I'm vegan). Surely we're being poisoned too. God help us all. Really the world must think over for complete ban on using of plastic or at least think regarding the safe disposal means. Thanks to La Leva di Archimede (ENG)" -for the information & nice article. This page contains a single entry by sal published on March 26, 2008 3:20 PM. Do Genetically Engineered Crops Give Higher Yields? was the previous entry in this blog. Mounting evidence shows red wine antioxidant kills cancer is the next entry in this blog.